Agriculture is one of the most prominent human activities that has become the underlying backbone of cultures, economies, and even the Earth’s climate. The process that constitute the act of farming is constantly being optimized and adjusted according to human needs and agendas. With the advent of industrialization, an increasing number of these human needs and agendas become satisfiable in grander extents, while we lack complete awareness about the long term effects of these decisions. When it comes to agriculture, it becomes increasingly important to make changes that are less provisional, but more insightful about how these changes will effect economies, politics, and food culture in the longterm future. Agriculture is an activity that feeds more than 7 billion people each day, and although farming practices have improved and evolved across numerous domains, certain practices either remain unaddressed, or lack a realistic outlook of their longterm effects. Agriculture is an activity that nearly all human systems like economies, trade, and political stability indirectly rely on. Without agriculture, humans would have never managed to form settlements with consistent food supplies and evolve beyond a migrating species. It is a practice without which a human society cannot be established and defined. Nevertheless, geologic history demonstrates that every human society who’s diet mainly consisted of annual crops (wheat, maize, rice, etc.) — eventually collapsed.1 Our post-industrialized society has yet to witness an existentially threatening food crisis, but as overpopulation and soil degradation become a problem, maintaining a constant food supply using our current industrialized farming practices; could eventually become no longer feasible. Humanity has gone a long way in improving the inequality of food consumption in today’s developed countries. Less developed countries saw a less significant increase in food consumption but have improved nonetheless. 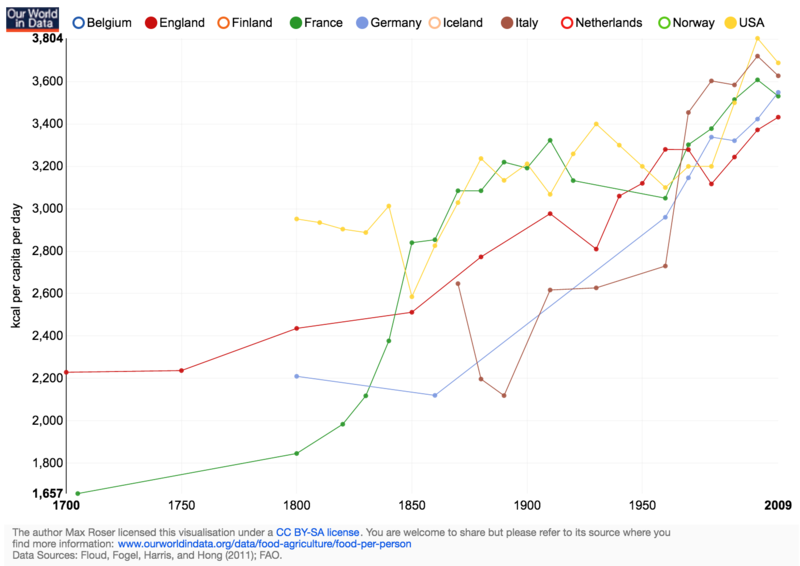 Developed countries like France, Germany, and England saw a twofold increase in daily caloric intake per capita since the 17th century.2 Despite the fact that food inequality continues to predominate even in the present developed countries, the current food cultures are significantly more charitable than they where a few centuries ago. Today we are also introducing problems that are on the opposite side of the spectrum, such as obesity. Globally, there are more than 1 billion overweight adults, at least 300 million of them obese.3 And along these advances however, humanity is now facing numerous other challenges that cannot be overlooked. The majority of the carbohydrates, proteins and oils that feed our populations are derived from annual plants — plants that synthesize sunlight for just a couple weeks per year, take a significant amount of time to mature, and then die; after which, their remains are discarded without a proper contribution to the health of the natural cycle. This is a process that is not just manifested within the activities of the human kind, but is also reflected within the artificially altered products that interfere with these natural processes and cycles. Exploitive agricultural practices such as tilling, monoculture farming, heavy use of herbicides and pesticides, demonstrate; that our cultures are inattentive to solutions that have the potential to take into account these natural processes and leverage their potential. The processes that where established by nature billions of years ago, allowed it to form an environment, in which single celled organisms morphed the Earth into an interconnected biologic ecosystem, harboring millions of trillions of organisms. These are living organisms that range from bacteria to human beings. Industrial agriculture seeks to maintain sovereignty over nature through artificial means instead of attempting to understand the processes that have been effectively occurring during the past several hundred million years. A thoughtless underestimation of nature’s potential when considering the fact that industrialization is a period of human development that existed for less than 200 years. As humans continue to rely on staple foods, soil erosion continues while vast areas of land no longer become suitable for farming. Land degradation and soil erosion already covers more than 30% of the total global land area effecting more than 3 billion people.4 In the US, farmlands are losing topsoil approximately ten times faster than they can be replaced.5 These statistics combined with our increasing global population and demand for food, do not suggest an improvement of the situation, unless it becomes a more deliberate collective goal. The technologies that most societies can economically afford, can be used to develop a form of agriculture that imitates natural ecosystems while providing and satisfying our human needs. We have the ability to engineer our society in a way that allows us to give a direct regard towards natural ecosystems which have a great potential to solve our social and collective problems. Our societies must therefore realize this potential and support incentives that manifest these social practices. The technologies that are exhaustively implemented in urban infrastructures, consumer products, and services — should be directed towards sources that would benefit humans in the long term. Our farm practices have evolved relatively insignificantly since the industrialization era, yet, we develop technologies in other areas such as cars, buildings, consumer products, electronics and atomic bombs — at disproportional paces. Among all the problems that urban environments face, agriculture is not regarded among our societies to the extents that it can be. This is explained by the fact that the demographics of the farming population have changed drastically over the past century. Our societies used to have the majority of the population growing crops and raising animals. 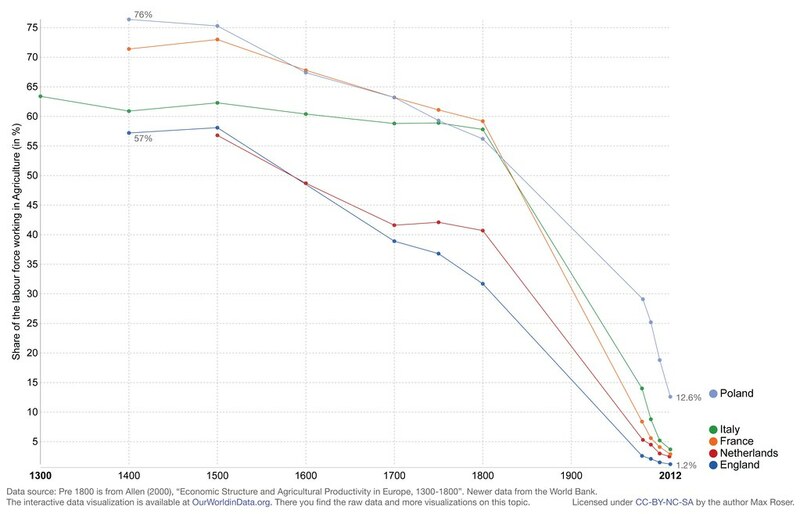 Today, the labour force working in agriculture in some countries declined almost tenfold since the Middle Ages. Ideologies such as agrarianism and agriculturalism that where to some extends established in ancient China, considered agricultural development the primary characteristic of a stable and prosperous society. It was believed that even the King should work along others in the fields, so that he can be consulted and carry out decisions that would turn out to be favorable to most.6 In modern-day societies however, not only did the social status of a farmer transform, but so did the demographics of human populations — where farmers represent just a fraction of the population in most developed countries. Most importantly, these demographics are nearly absent in urban environments where farming barely exists as a practice. Even rural areas where farming is a more common occurrence, are physically and conventionally detached from their demanding urban societies. Today, in our post-industrialized mindsets, define two leading categories of individuals that sustain our economies; the producer and the consumer. With advances in technology, we replaced what has once been an artisan practice for growing food, into an endless optimization problem that is being mediated almost entirely by advances in automation, technology, and bioengineering. These advances have solved numerous scarcities, inequalities, and shortages of food in numerous countries. Such advances however, have transformed entirely how food is culturally perceived — what was once the work of an artisan, is now a background producing process, whose only interaction with the consumer, is mediated through a disconnected economical system. Such a system, established an unprecedented form of relationship between the consumer and the producer, where each side is represented by some entity or corporation. The cultural detachment between the producer and the consumer can to some extents, be attributed to a social predicament that has to be addressed through bottom-up from of organization. 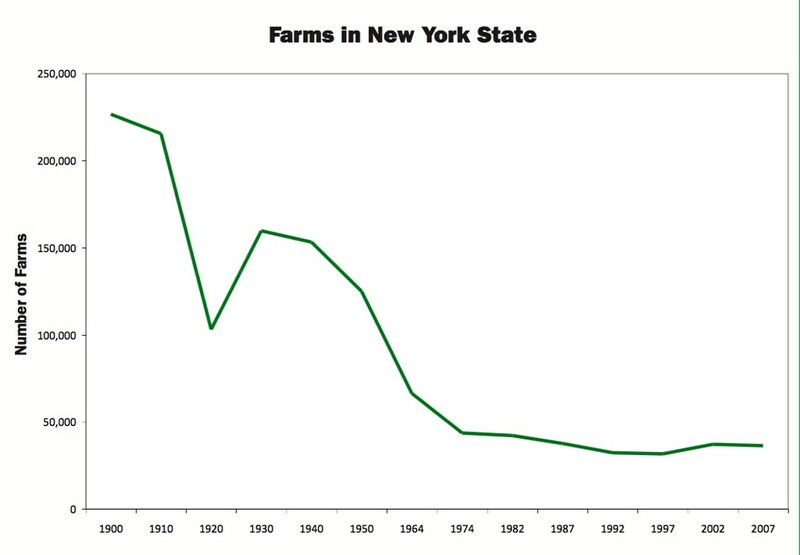 The number of state farms in New York state has declined drastically during the course of 20th century. It is important however, to not discredit attempts made by some urban societies to tackle unfair farming practices. Such attempts are constantly being made by organizations based in New York City. A significant portion of organizations, which often include growers and distributers — attempt to bridge the gap between the farmer and the consumer. Urban agriculture can also involve animal husbandry, aquaculture, agroforestry, urban beekeeping, and horticulture. While some of these are modern types of urban farming, the act of urban farming is not an unprecedented form of human practice. It can be traced back as far as to the ancient Egyptians who frequently used community waste for farming in urban environments.7 Urban environments today are different from even the ones that the where present in the most advanced previous civilizations. Our modern densely populated areas, always require support from the outside in order to sustain the needs of its urban population. Today, city farms, hydroponic farms, and farmer markets evolved from previous farm practices that where practiced by our ancestors. If back then, the most justifiable (if not the only) reason for farming was to battle starvation and feed the population; today, these motivations extend to humanitarian reasonings. Hunger remains a problem in developed countries even today. In US, more than 40 percent of food goes uneaten, which is more than 20 pounds of food per person every month — enough to feed the U.S. population almost twofold.8 Despite these severe inefficiencies, humans have many other imperatives for addressing problems that concern the subject of food. This includes tackling food inequality, transportation costs, subsidized industrial practices, negative environmental impacts, and elevated food pricing. 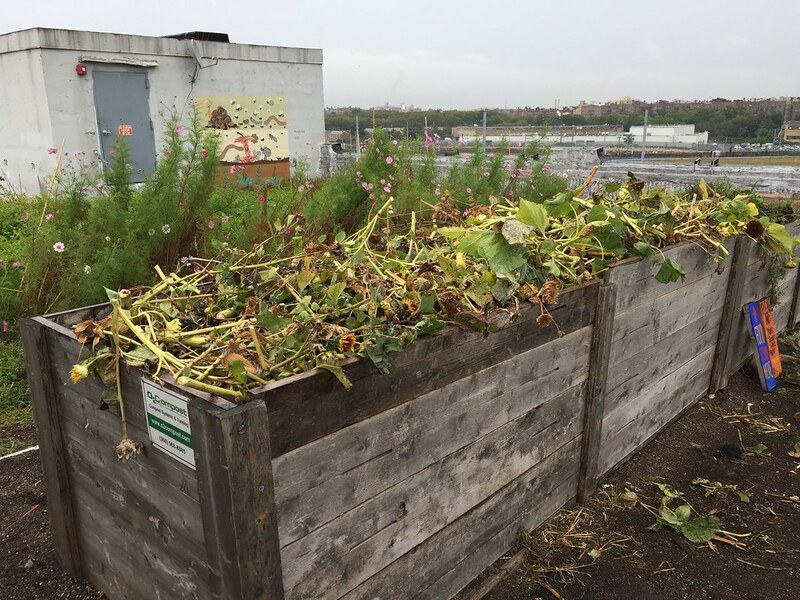 The problems that concern the general subject of food, entail changes in the logistics, systematics or even the ideologies that surround the subject of sustainable urban farming. These techniques and methods are not derivatives of profound academic theory nor of thorough scientific research; these are methods that can be easily derived from nature through observant and perceptive observations. Regardless of how complex human societies are, nature has formed various patterns and techniques that humans can apply within their own activities. Besides nature, these ideas can also be derived from human history, and a broad range of other human activities. Such subjects include decentralization, emergent systematization, agrarianism, communitarian and anti-capitalist values. Among these categories, not he least important one is establishing decentralized food networks. These are important since it is a process that allows organic food communities to adapt to the surges of it’s demanding populations. Despite the motivations to introduce farming into urban environments, it is also important to realize that even if urban cultures had an abundance of urban farms, they wouldn’t solve the most important problems humans face thus far — our reliance on staple crops — an industry that is mostly under the control of monopolies who developed their own centralized production and distribution networks. Urban farms would greatly depend not just on modes of food production, but also on the way the food is distributed. The distribution networks that currently dominate the food industry, include networks that not only have a profit incentives to maintain unsustainable farming approaches, but also subsidize and facilitate the production of crops that are subject to such practices. These food monopolies have always adhered to maintaining a top-down decision making system. Attempts to interfere with these malevolent practices, results into lawsuits whose resolutions end up in favor of these monopolies, even when these lawsuits involve government and state agencies. Current agriculture policy concentrates mostly on production and trade and is disconnected from the issues that are vital to humans. But many other forms of interventions provide an incentive for a change. This includes social interventions, which reiterate existing top-down systems and provide room for a development of a new bottom-up form of agriculture. These will prove to be effective for combating corporate disregard and mismanagement of issues that effect the future of humanity. 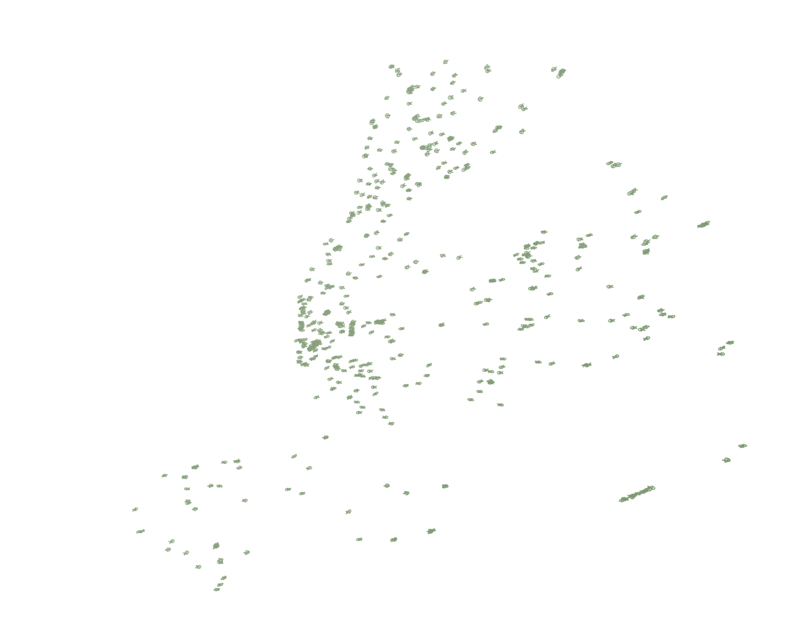 In New York City alone, there are a more than 130 farmer markets. An example of a decentralized form of organization. Even if the distribution of organic produce becomes well established, there would always be times where spikes and dips in demand for a particular product will cause a misconnect among the producer and the consumer. It is thus important for this network to maintain a close collaborative connection among all its growers and distributers. This will allow the distributor to satisfy a particular spike in demand by spreading it across the whole food network. 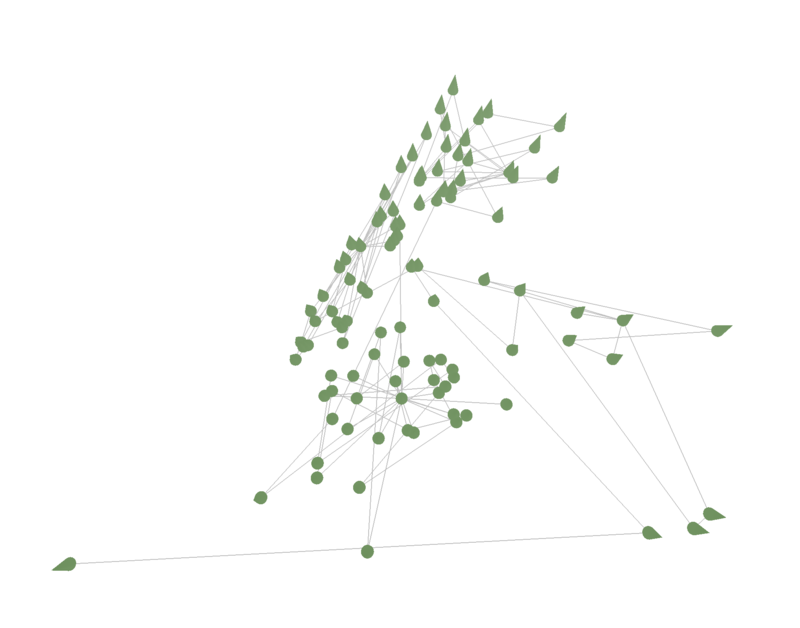 It is this what constitutes an emergent decentralized food network where food production adapts to a demand. This decentralized food network provides an alternative to centralized corporate food networks. It however remains a challenge to adapt to these decentralized food networks, but as these circumstances evolve, new solutions to urban farming are constantly being introduced. Interfering with the industrialized food industry, signifies not just challenging the methods of growing food, but also rethinking food distribution from a social perspective — not just adapting to the demands, but also figuring out ways of dealing with waste, infrastructure, and the cultural regard towards food. These goals must resonate not just among the farmers and their food distributors, but also among the public, which is becoming increasingly aware about food scarcity and industrial practices. New York has gone through a significant change in population and demographics since the most prominent decades that followed the industrial revolution. If in 1930, each farmer produced enough food to feed 12 people, by the 1990s a farmer produced enough for 100 people.10 As the fraction of farmers among the population declined, less than two percent of today’s US population is employed in farming. Even those who are employed, are nearing retirement, with farmers six times more likely to be over the age of 65 than under the age of 35.11 It is therefore evident that there is a demographic transformation occurring at the social level, although its causes can also be attributed to technologic and economic developments. Historically, the problems that are associated with agricultural production, are born of national needs and policies. Increased mechanization and centralization of agricultural production have enabled U.S. to feed millions of new Americans over several generations. As in the rest of the country, production in New York has become more concentrated, with the average size of the remaining farms increasing by approximately 75 percent since 1930.12 This makes it increasingly difficult for smaller producers to enter and thrive in the market. Federal subsidies have further supported centralized and large-scale production operations. These subsidies for the most part, have not focused on smaller producers since historically speaking, the state incentive was to keep up with agriculture production along with the US population’s growing food demand. Even thought local and non-profit farms and organizations have tried to find profit margins within these nationally subsidized industrial practices, it continues to be a major underdevelopment.13 It is crucial that the New York state supports and develops this infrastructures through procuring changes, although a wide range of these incentives must be implemented at a federal level. Today, the problems that effect the city of New York, are both derivatives and contributors to the local and global systems. Even a change on a smaller scale, can effect the systemization of systems of higher orders. This is why it becomes important to introduce changes at a smaller scale, the foundation of which, is the cultural regard towards food. These can include various events organized by the city as well as the support from food distributers and even the urban farms themselves. The Brooklyn Grange is an example of an urban farms whose focus includes the transformation of the social regard towards food, as well as supplying the city with organic produce.14 Brooklyn Grange in Queens, NY was visited on an overcast day where I witnessed an evocative relation between the farmers who where taking care of the herbs, spices, fruits, and vegetables; and the industrialized skyline overlooking Manhattan, NY. Having an opportunity to witness this farming activity amid such an industrial environment in such an overcast setting, evoked a feeling of appreciation and importance of this specific form of practice in urban environments. The farmers where nice enough to answer a few of my questions about their farm’s operations. One of the most crucial questions that I asked, was what are the principle expenses for maintaining their farming business. Most of the responses emphasized on the difficulty of recruiting and establishing a workforce. This is indeed one of the struggles that the activity of urban farming practices face in general, which also appears to be a direct cause of the decreasing fraction of farmers among the population.10 Recruitment of the farming workforce however, is rewarding across a wide range of other human activities. For example, it is estimated that for every 100 jobs created in New York City’s food manufacturing sector, 76 jobs are created in parallel in other industries.15 Increasing the farmer workforce can be proven to be an important drive for economic and industrial development. But the most important questions that remained unanswered are the social incentives and motivations present among the city’s population to recruit this workforce. If recruiting urban farmers can be attributed to as a social problem, it is important to identify this problem and find ways in which it can be addressed. Typical business developments usually prosper in areas where there is an unmet demand for a particular form of production. It is estimated that New York City has an unmet demand for local food, which in most imminent cases, should lead to propelling incentives and business growth. It is estimated that New York City has an annual unmet demand of nearly $600 million that could be captured by local food growers.16 Finding a profit margin in an area of unoccupied economic activity, is frequently associated as an opportunity among businessman and entrepreneurs. Urban culture however, has not always been the most attractive topic amidst venture capitalists, but as innovation is being actively introduced into this field, this tendency has begun to shift. Since its hard to maintain a non-profit business model, most farms end up being for-profit organizations. 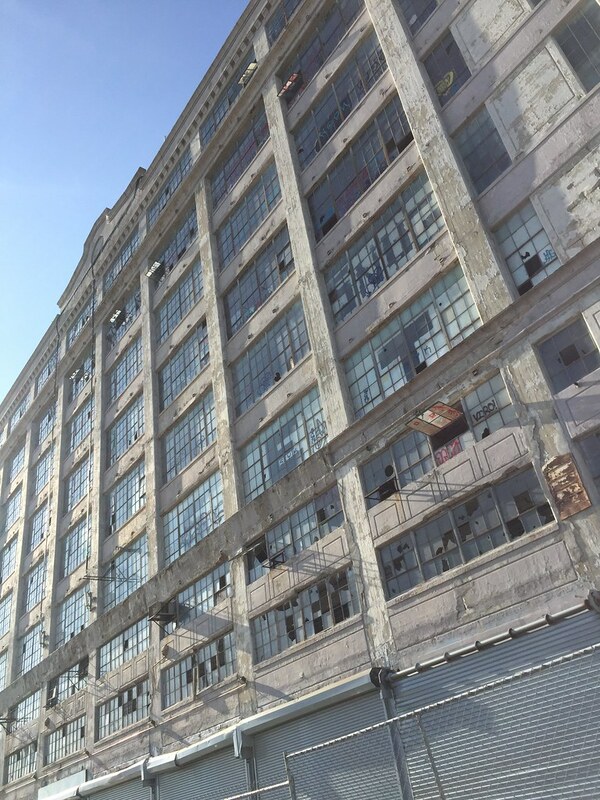 Brooklyn Grange in particular organizes various events such as weddings and various other types of special events. “Being creative” is frequently what permits an organization like Brooklyn Grange Farm to find ways of sustaining profit margins. I asked whether rent and gentrification play a role in their farming practices, they responded that it definitely does, as it decreases the potential of establishing a more abundant concentration of local farms and cultures that surround these practices. 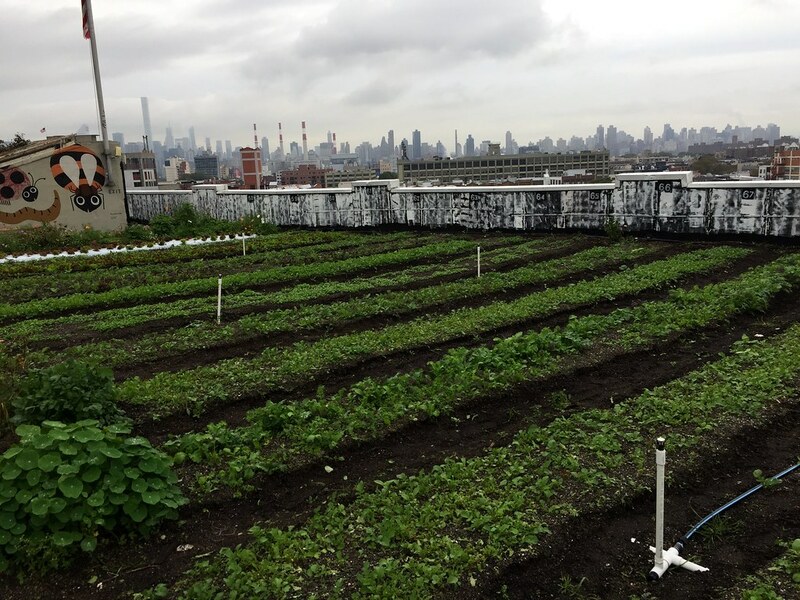 Rooftops can be easily seen as spaces in which community farms can be created, such as the one that Brooklyn Grange managed. Although rooftops of many buildings are frequently unoccupied, they are not commonly given out at an affordable price. There are not that many incentives for rooftop farming, which to some extents, is considered as the equivalent of a grey market that is not yet subject to extensive rule and requirements, nor is legally defined as something outside of the scope of untraditional usage of rooftop space. The idea of rooftop farming however is a very intriguing practice in itself, not only does this practice have the potential to benefit the locals, but a new industry can sprout out of a city incentive that could convert abandoned Industrial buildings into rooftop farms. The organic food activity however, is neither a source for easy money, nor is it a stock market which solely relies on funds. Food distribution frequently entails the establishment of a network and infrastructure among the food growers and their distributers. This is why these small scale farming establishments are more dependent on community support, which may perhaps be a great alternative to consumerist and corporate based support. These farming businesses must frequently rely on creative solutions to some problems, that would otherwise not be attempted to be solved in corporate environments. Urban farming business, entails the development of tools that have not been established by the farming industry, but can also to some extents, been used by our ancestors. Urban farming requires development and experimentation, some of the products of which include hydroponic farming, an area that is becoming increasingly popular in urban settings, but arguably functional in providing the primary forms of consumable foods. In industrialized settings, the demand is consistent and food production can be easily adjusted and predicted. Thanks to industrial grade processing facilities, large food corporations can afford practices that improve consistency of their activities, to an extent that these have become the consumer’s expectations. Produce is expected to have a particular color, taste, and form, which can discourage the consumer if the product is not up to the standards. With urban farming however, the food supply depends on the current harvest, season, and supply levels. If there is high demand for a particular produce, some food distributors simply cannot provide it. Restaurants and retailers attempting to fill this demand through their offerings encounter difficulty with sourcing regional products from wholesalers. John is an interviewee that I managed to talk to who works as a distributor for Hudson Valley Harvest.18 This is a distribution company whose clients include dozens of colleges and universities as well as corporate clients such as Goldman Sachs, Citi Group, and Google. They are also one of the largest organic food distributors for Whole Foods and the Westside Market. When asked the question of how their business tries to address the problem of industrial level conglomerates that feed the majority of the country’s population, John replied that one of the aspects that helps to drive their business is a change in the public regard towards food quality. It frequently entails a change in the way people demand food, which is based on the acceptance that there is limitation to what nature can provide. It requires a transformation from a restaurant-like, consumerists demand mentality, to a one that accounts nature’s limitations and adapts to its providing ability. John mentioned an example where one of his clients demanded baby carrots of a particular size. He emphasized however, that his distributer company nor the local farmers from where the organic product is sourced, have the sorting facilities nor the infrastructure that would allow them to satisfy such a specific consumer need. It therefore becomes important for the public to rethink the way it demands something from nature, and also establish a more understanding form of relationship between the producer (farmer, grower, etc.) and the consumer. Local food businesses frequently require an appreciation and understanding from the consumer side — that its demand cannot be as easily compared to the way a supermarket might satisfy the demand. John’s distributor company however, does not entirely count on the public’s universal awareness about the limitations of these demands. Hudson Valley Harvest constantly strives to improve their own infrastructure to an extent that would allow them to balance out the availability of a certain produce among their growers. Improvements are constantly made to the way John’s distribution company, processes, orders and delivers food that comes fresh off the farm, while traveling just 50-150 miles from its point of origin. When asked whether he sees a potential of urban farms taking over certain parts of his business, John replied that he would be happy to see urban farms outpace his activities, because that would signify that locally grown organic produce is becoming an inherit part among our culture. But even then, John believes that urban farms are unlikely to survive on their own since even as a distributer based outside New York City, there is a struggle with supplying the city’s demand for food — let alone a distributer that would focus just on New York’s metropolitan area. Despite the benevolence and their potential, urban farms do not seem to be a complete substitute to land farming. The crucial point extracted from this interview is that internal and external food organizations must work collaboratively in order to address the problems of unsustainable industrial level farming practices. Establishing decentralized, non-corporate forms of food distribution is a crucial. As people become aware about this part of their life, even the simple act of eating a salad has the potential of creating jobs for organic farms. Direct-to-consumer sales of agricultural products have increased by $399 million (49 percent) from 2002 to 2007, and by $660 million (120 percent) from 1997 to 2007. Since 1994, the number of farmer’s markets recorded in the United States has more than tripled from 1,755 to 6,132.19 In New York City alone, there are a more than 130 farmer markets. Despite John and his distribution company mainly serving corporate clients, they like many other food distributers, maintain a priority in contributing to community organizations across all five boroughs. Similar groups are known to serve more than 400,000 free meals to hungry New Yorkers every day.20 Even if distributors provide for schools and corporate customers, there are still 1.4 million New Yorkers who live in households that cannot afford an adequate supply of nutritious food.21 It therefore becomes also important that the state provides incentives would also address the needs of these minorities. Sustainable approach towards food activities does not just entail an altruistic mindset, these approaches also entail an economic incentive as well. Food decomposition in landfills can produce 4 to 8 percent of all the food industries greenhouse gases in the form of methane.22 It would seem that an activity like this would effect businesses unless the tradeoffs where informed by the state. Even Walmart, а corporation that frequently gets criticized for corporate greed, takes precautions directed towards sustainability for the simple fact that it minimizes expenses.23 Even if composting is not required at a federal level, organizations have an incentive to do so since it decreases expenses. This includes recycling food packaging, reuse of grease, composting of organic matter, and other recovery techniques that can facilitate farmers to reduce the costs of disposal and greenhouse gas emissions. What can be taken from the experience is that is important for the city to come up with incentives that support urban farm practices. But state incentives can sometimes prove to not be the ultimate solutions to all these problems. For example, agricultural production is energy intensive, greatly contributes to greenhouse gas (GHG) emissions, and is not economically viable for many farmers. Food processing and distribution require large non-renewable energy inputs and further impact the environment surrounding the New York State.24 But another problem would be labour, where not many volunteers would do non-profit work. It is therefore important that the city adapts certain incentives that would allow urban farming organizations to adopt spaces for agriculture activities that will benefit humanity in the long run.